Help developing countries to address supply-side bottlenecks and unlock their potential to benefit from trade by increasing assistance to developing countries, and especially least developed countries, towards building their physical, human and institutional capacity to trade. No numerical target were set. Aid for Trade (AfT) commitments reached $55.4 billion in 2013, representing an increase in real terms of 119 per cent above the 2002–2005 baseline average. The average annual increase of AfT commitments of 11 per cent has led to a significant increase of AfT in total sector allocable aid from 32 per cent during the baseline to 38 per cent in 2013. A total of $256 billion has been disbursed on AfT programmes since 2006—two thirds by bilateral donors and the remaining by multilateral donors. In addition to the standard channels for disbursing official development assistance, AfT for LDCs is also provided through the Enhanced Integrated Framework. Most bilateral donors provide support in the form of grants. Developing-country providers of assistance, such as the United Arab Emirates and Kuwait, increased their commitments in 2013, reaching $1.8 billion and $832 million respectively. There is a need to ensure continued resource mobilization of Aid for Trade, enhanced predictability of Aid for Trade resources and greater alignment in the delivery of Aid for Trade with the priorities of developing countries contained within their national development plans and strategies. 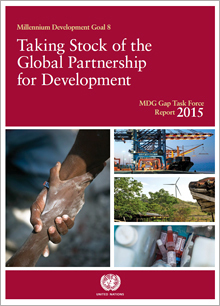 For related commitment, see MDG Indicator 8.9 which refers to the proportion of ODA provided to help build trade capacity.